Development on DirtyPCBs.com is winding down, so I’ve had some time to play with hardware. I’ve said the same thing for a few years now, but this time it really happened! This update of Bus Pirate v3.x crams in a major new feature, and slightly lowers the total cost. Two China-sourced analog switches enable pull-up resistor voltage selection – 3.3volts, 5volts, or External – directly from the terminal menu. A new IO header is compatible with fancy tangle-free silicone wire probe cables. An updated USB to serial converter chip reduces the BOM to offset the cost of the new features. 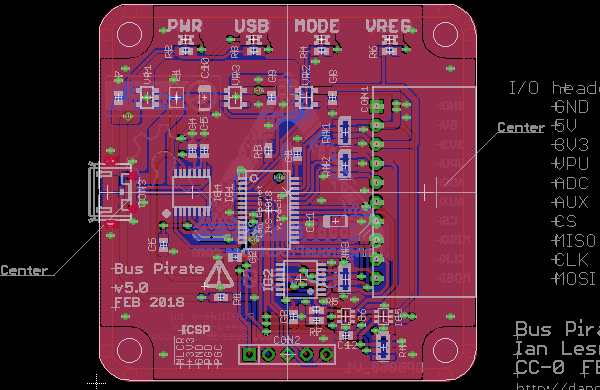 Bus Pirate v3.x has on-board pull-up resistors for 1Wire, I2C, and any other situation where an open drain bus is used. Currently the pull-up resistors are fed through the Vpull-up pin (Vpu). In almost all cases I use a wire to connect the Vpu pin to the on-board 3.3volt or 5volt power supply. It would be so much more convenient to select one of the on-board power supplies from the Bus Pirate menu, instead of connecting an extra wire to the Vpu pin. The v4 hardware made an attempt at this, but with a circuit that creates a lot of voltage drop. 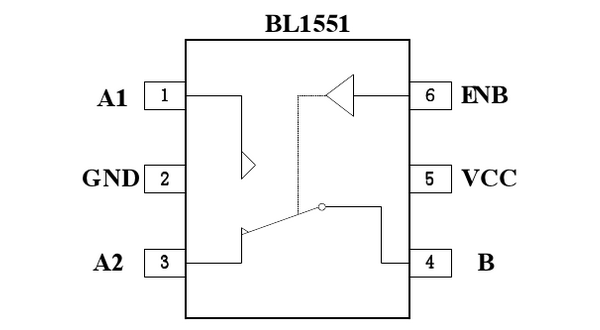 I spotted the BL1551 analog switch while browsing Chinese chip datasheets at JLC. BL1551 is a $0.04 analog switch with low on-resistance (2.7ohm at 5.0volts) and high current capacity. It seemed like a good candidate for switching the pull-up resistor source. Two BL1551 are chained together so that three input sources (3.3volt, 5volt, Vpu pin) are controlled by two pins. All the PIC microcontroller pins are already used, but a little hack lets the hardware version ID pins drive the BL1551. Bus Pirate v3.x has always used a 2x5pin IDC connector. These are super common and easy to use with 0.1” jumper wires from the parts box. Unfortunately there aren’t many good cable options for an IDC connector, a probe cable made from ribbon wire always feels cheap. I rolled a few versions with various JST connectors, but a custom cable makes everything less handy. Eventually I settled on a 1x10pin 2543/TJC8S-10AW connector (equivalent to Molex 70553-0044), a common 0.1” pin header inside a keyed/locking shroud. Jumper wires still work great because the pins are 0.1” pitch, but now we can make high quality keyed/locking probe cables with tangle-free silicone wire. 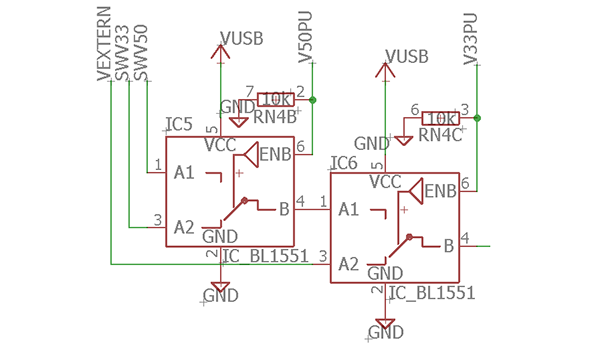 The pinout on the new connector is corrected to MOSI-CLOCK-MISO-AUX-ADC-Vext-3.3V-5V-GND. The original v3.x pinout was mangled in early revisions, and the current mess has been grandfathered-in since the first production run. The FT232RL has been the go-to USB-to-serial converter chip for a decade (IC2, left). 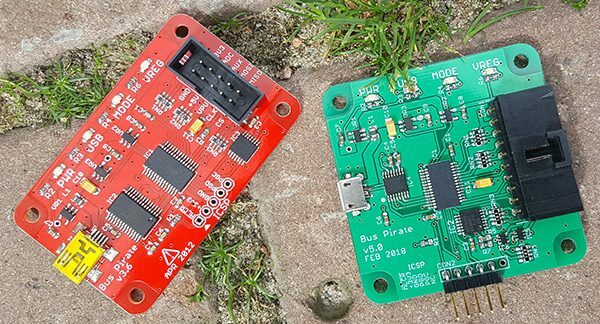 It’s used on the Bus Pirate v3.x, as well as oh-so-many Arduinos. FT230X is a new version that uses the same FTDI drivers everyone already has installed, but it’s half the price and comes in a smaller package (IC4, right). Moving to the FT230X frees up board space for some PCB tweaks, and reduces the BOM cost by about $2 in single quantity. What kind of USB cables do you have laying around these days? I’ve got a ton of USB Micro B cables from phones and phone chargers, and those are slowly being replaced by USB C cables. The Mini B connector on v3.x is a relic. My updated board uses a USB Micro B connector. It’s not hand-solder-hobby-friendly like the USB Mini B connector. To be completely honest, every hand-soldered prototype connector eventually broke off the board, often lifting traces with it. There are two versions of this hardware in git – one with a generic Chinese USB connector, and one using an expensive Molex connector with through-hole reinforcement. Swapping the IO connector and USB chip made it possible to fit everything on a 5cmx5cm PCB. This version fits on the super cheap 5x5cm PCB prototype packs sold at most board houses. This Bus Pirate has been on my bench for about six months, and it’s hard to go back to an older version. Selecting the pull-up voltage from the terminal is really convenient. The IO header pinout makes a lot more sense, and the cable options are pretty sweet. The Micro B connector may be the best update, now the Bus Pirate works with the phone cables I always have around. The Eagle schematic and PCB files are in git. The hardware is significantly different from v3.x and needs a custom firmware build, so I called it v5. The version isn’t set in stone. There is also a firmware branch with support for the new hardware. There are no plans to produce this version of the board without lots more testing and community feedback. PCBs for the Molex USB version should be available in the free PCB drawer in a few days.